Green Left Weekly, of February 8, 2006, carried an interesting obituary on Schafik Handal. This look at one of Latin America's most influential revolutionary leaders, further illustrates the ties between revolutionary leaders on the USA's doorstep. It also shows that revolutionary socialism is far more of a living movement than most of us the West would appreciate. I reprint the article with very minor editing. Farabundo Marti National Liberation Front (FMLN) leader Schafik Jorge Handal "Comandante Simon", died suddenly of a heart attack on January 24. He collapsed at the airport on his return to El Salvador from Evo Morales' presidential inauguration in Bolivia. Leftists from across the continent immediately began to arrive at the airport to pay tribute to this life-long activist and great leader of the Latin American left, who fought until his very last breath for the creation of a better world. Recognising that Handal was a national hero and one of the most influential political activists and ideological thinkers to form modern El Salvador, the countryÂs right-wing president not only declared three days of national mourning, but guaranteed access to the occasion for Handal's friends. This included the delegation sent by Cuban President Fidel Castro, with whom El Salvador does not have diplomatic relations, comprising the leader of the Cuban Ppeople's Ccongress, Ricardo Alarcon and a team to work with the FMLN on the funeral arrangements. 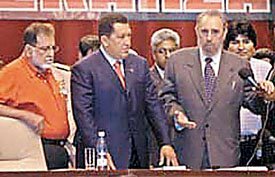 VenezuelaÂ's socialist president Hugo Chavez Frias sent a delegation including the Venezuelan ambassador to Cuba and the president's brother, Adan Chavez, leader of the National Assembly Nicolas Maduro and the hugely popular Caracas mayor Freddy Bernal. Handal's friend and comrade Morales did likewise, along with presidents and former presidents, activists and political and social movement leaders from around the continent and the world. San Salvador was a sea of red. Not since the assassination of archbishop Oscar Romero in 1980, and perhaps not even then, had so many ordinary Salvadorans poured onto the streets and into public places. They held banners stating "Long Live Comandante Schafik" and "Schafik, we continue the struggle for you". Tens of thousands of militants poured into the centre and 100,000 youth attended a political rally in Handal's honour, broadcast live on the internet by FMLN youth radio. Participants from all around the world paid homage; messages were heard from Chavez, Castro and Morales, and the best revolutionary performers played music. Handal, Chavez and Castro at Karl Marx Theatre, Havana, May 2005. Delegations added flags and mementos to Handal's coffin, not just of El Salvador and the FMLN, but from struggles around the world, a red Palestinian scarf, the former Soviet Union's flag, and other symbols of struggle from those who knew and solidarised with Handal and to whom he gave solidarity. On the red cloth curtain of the stage where he lay in the university hall, a simple white poster said: "Bush, Imperialist, Murderer", a fitting statement for this man who gave his entire life to struggle to overcome imperialism and repression. Schafik Jorge Handal was born in Usulutan on October 13, 1930, to a Palestinian migrant family. Handal's father Abdullah Handal Nasser took the name "Jorge" when he migrated to El Salvador in 1920, the time of the post-WWI colonial partitioning and the "Arab riots" in Palestine. Schafik Handal was only two years old when La Matanza, the famous insurgency led by the legendary Farabundo Marti, was brutally repressed by the Salvadoran military, resulting in the massacre of more than 30,000 campesinos and indigenous peasants. In 1944, as a 14-year old, Schafik was already on the streets organising for a national strike against the dictatorship that ruled El Salvador with an iron fist. By 18 he was a leader of both the Democratic Students Association and the Revolutionary Students Committee at the University of El Salvador. His public revolutionary activity, at a time when most preferred clandestine activity, led to many periods of exile and detention. Following the success of the Cuban Revolution in 1959, and fearing that Handal would achieve a similar victory, the dictator Jose Maria Lemus had Handal captured and held for three months in Guatemala. Handal's children and comrades recall many occasions when they were certain he had been killed. Yet somehow he always returned, ever stronger and bolder for the experiences. From 1959 to 1994, Handal was on the leadership bodies of the Communist Party of El Salvador, including as general secretary from 1973-94. Handal was the public face and spokesperson of many left formations during this period. Perhaps a key achievement was his negotiation of an alliance between the Communist Party, the National Democratic Union and the Christian Democrats to form the United National Opposition for elections in 1972 and 1977. Handal was key in founding the FMLN and in working out the strategy and operations of the guerrilla war from 1980-91, when he was also commander in chief of the Armed Forces of Liberation (FAL), one of the five armed groups within the FMLN. Handal served on the general command for the entire period of conflict, and was also a key negotiator of the peace accord. Handal was a founder of COPAZ (the National Commission for Consolidating Peace) and was subsequently elected general secretary of the FMLN. Handal was never isolated from the brutal realities of life in El Salvador, and one of his own brothers, Antonio, was disappeared on November 11, 1980. Another brother, Farid, was a guerrilla until his death in 1989, and Handal's own son Jorge was also involved in combat with the FAL. Handal's family lived in exile. The FMLN was also an internationalist liberation army, and Handal fostered fraternal relations with other forces opposing oppression and imperialism, and organised personnel exchanges as a part of that internationalism. Handal remained a passionate advocate of revolutionary socialism throughout the transition of the FMLN from an armed united front, to a multi-tendency socialist party. Through intense debates on the nature of the new, more democratic climate and how to relate and adapt, particularly in the electoral field, Handal renounced moves towards social democracy. Since 1997 Handal was an FMLN deputy to the National Assembly. He was also elected leader of the FMLN legislative fraction and the party's president. Handal stood as the FMLN's candidate for mayor of San Salvador immediately after signing the Peace Accords, but he lost due to a scare campaign about electing a guerrilla as mayor so soon after the conflict. He also contested the presidential election in 2004, and gained an impressive 39% in a four-way contest. He lost to the right-wing media mogul and sports commentator Tony Saca. Amidst all his political activism, Handal also married twice, once from 1949-80 to Blanca, with whom he had three children. His second marriage was while living in Russia during El Salvador's war, to Tania Bichkova, with whom he had a daughter Xenia in 1982. Bichkova has thanked the Salvadoran people and the FMLN for their outpouring of love and respect for her beloved Schafik, urging them on to realise his dream of a socialist El Salvador. The last word at Handal's funeral went to another historic figure in the FMLN, Comandante Nidia Diaz, who said to the tens of thousands gathered: "We are not just burying the body of comrade Schafik, remember that we are planting a seed to germinate in each and every one of us." The FMLN continues to advocate the defeat of capitalism and imperialism and the building of a socialist society, in order to truly realise the sacrifices of the more than 80,000 who died in the war, and those who continue to die due to the vicious impact of neoliberal policies and imperialist expansion. That was Handal's life-long struggle. As the FMLN has proclaimed: Onwards to victory, Schafik lives on in the struggle! Info on the United States' involvement in El Salvador. "1981: Ronald Reagan becomes president of the United States. 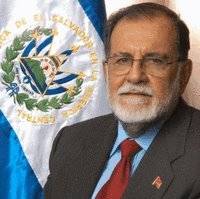 He regards the conflict in El Salvador as a U.S. national security problem, believing the FMLN is part of a communist drive to take over Central America. Washington designs strategies of low-intensity conflict for Central America, and the U.S. directly intervenes in the region’s politics, military affairs and economy. The Salvadoran people are repressed by death squads (including civilian, police, and military members) and a brutal military supported by Washington dollars. The U.S. government trains Salvadoran army units in the United States and El Salvador in counter-insurgency tactics."